In hindsight, it seems so obvious: How could anyone not have seen that building a water park in Draper was pretty much a license to print money? The newly opened Cowabunga Bay arrives as a perfect summer solution for that south-valley population that would consider Seven Peaks too far south, Lagoon too far north and Raging Waters too far west. But does it offer more than geographical convenience? 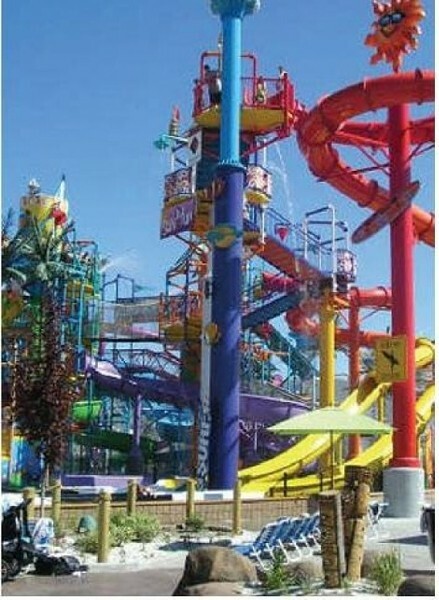 The park touts its six-story-high, 225-footlong Cowabunga Splash structure and its two tipping buckets as the “world’s biggest splash,” and indeed, it’s an impressive place for kids of most ages (more on that later) to get doused, squirted, sprayed and otherwise dampened. Slides accommodate a variety of comfort levels, but the three longest are all great fun. The green “Hang Ten” is a rocket-fast open slide with the kind of sharp turns that send a body high onto the walls. The enclosed “Bonzai” ends with a killer free fall. And “Mondo” kicks up the thrills by shutting out almost all light. The real appeal, then, is for the teens and older kids, because most of the park is not designed for younger kids. The shallow Cowabunga Beach pool and “lazy river” feature are fine for the little ones, and a few Cowabunga Splash features and smaller slides target toddlers, but the admission price is pretty steep if you’re not planning to hit the slides. This is a place to come if you expect to get very wet, pretty much nonstop, and scream a little while you’re doing so.